How Long Does The Whole Certification Process Take? After receiving your submission and payment, T206museum.com will examine and return your submitted card(s) along with Certificate Of Authenticity (COA) within 48 to 72 hours. Do You Certify Card That Has Been Graded By Other Companies? Do You Need To Break Open The Encapsulation If A Card Has Been Graded? It depends. If the plastic case is preventing authenticator from examining the card, breaking open the encapsulation might be needed. Of course, T206museum.com will contact you and have an agreement before breaking open the plastic case. Will You Slab My Card After Examination? No. T206 Certification Service do not do encapsulation at this point. How To Submit My Card? 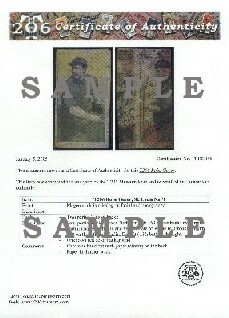 #1, E-mail coa@t206museum.com how many and what kind of card(s) you are going to submit. #2, You will receive instructions of how to ship your card(s). #3, Send your card(s) (with full insurance) and payment to the given address. #4, You will receive a confirmation email after received your submission. #5, A follow up e-mail will be sent within 48 to 72 hours after certification process is done. #6, Your submission along with Certification Of Authenticity (COA) will be returned using the next day service (or depends on your prefered shipping method). Why Should I Choose T206 Certification Service? There are many companies provide authenticity services. However, none of them have expertise or full understanding on T206 printing process. For those companies that grade unusual T206s, in most cases, they do not identify the errors/variations on the label. T206 Certification Service will issue COA identify and explain the error/variation and guaranteed the authenticity of your card. Yes. The replacement fee is $10.